In August 2007, Bishop Edward James Slattery visited Merton College Oxford, to attend the training conference and to celebrate Pontifical High Mass at the close of the proceedings, having humbly accepted some tuition himself. I had the privilege of meeting him at the conference. Last year, he announced that he had returned to the practice of celebrating Mass in his Cathedral in Tulsa, Oklahoma, facing towards the East. 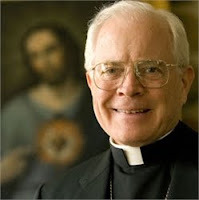 In 2004, Eastern Oklahoma Catholic gave a summary of all that Bishop Slattery had done to combat and prevent the scourge of child abuse, leading to praise from the Child Abuse Network in particular for his co-operation with the civil authorities. In addition to these various actions, Bishop Slattery ordered a Holy Hour of Reparation to be held at the same time in all the Churches of his diocese. He was therefore an ideal choice for celebrant of the Solemn High Mass at the National Shrine at Washington DC last Saturday to celebrate the fifth anniversary of the election of Pope Benedict. He stepped in at short notice in place of Cardinal Castrillon Hoyos who has recently been mired in controversy over his letter to Bishop Pican. It turns out that he was not only an ideal choice because of his commitment to the Sacred Liturgy and his excellent record of action in relation to safeguarding children: his magnificent sermon has received praise from coast to coast. It deserves to be widely circulated on this side of the Atlantic too. You can read the text of the sermon at the website of the Diocese of Tulsa. Fr Z has a podcast of the sermon if you would like to listen to it.